SWN’s seismic testing in the area last year sparked daily protests and blockades. Friday’s march is also meant to be a show of support for those still facing charges, the group said. On their way to the SWN offices in Moncton, they will stop at the courthouse, where they will sing and drum to protest the charges against Germain Junior Breau, of Upper Rexton, and Aaron Francis, of Eskasoni, N.S., in connection with the Oct. 17 protest. Judge Leslie Jackson is scheduled to hand down his decision on their case on June 19. “There’s been some false arrests that have occurred, and we view this as a way of them strong holding us, and preventing us from being able to exercise our freedom of speech,” said protester Barbara Quigley. 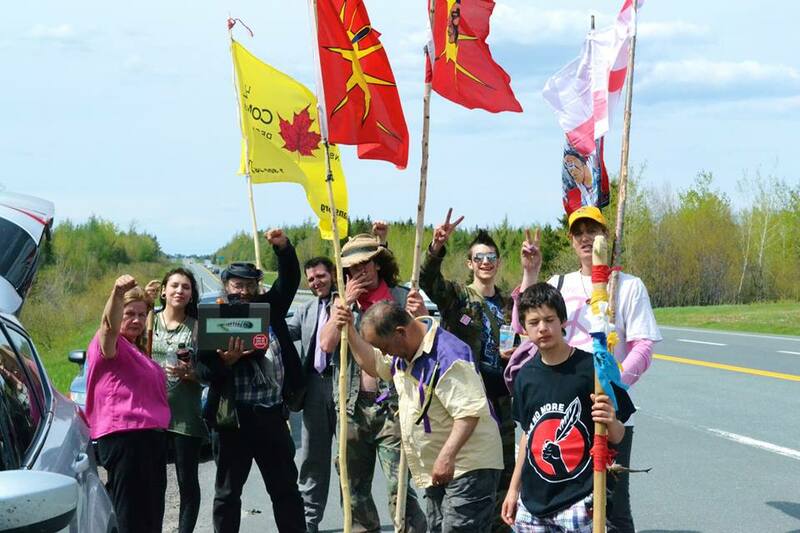 The marchers plan to camp out in Bouctouche on Friday night, make their way to Shediac, where they will stop at the remand centre on Saturday, and then continue on to Moncton on Sunday. SWN Resources Canada has said it does not plan to conduct any seismic testing in New Brunswick this year. It will be surveying land and doing other preparations for drilling the exploratory wells, including site construction, officials have said. The company plans to drill four exploratory wells in 2015, in the next phase of its exploration program for potential shale gas development in the province. The company has initiated the environmental impact assessment process to move forward with exploratory drilling. Hydro-fracking is a process where exploration companies inject a mixture of water, sand and chemicals into the ground, creating cracks in shale rock formations. That process allows companies to extract natural gas from areas that would otherwise go untapped. Posted on May 30, 2014, in Oil & Gas and tagged anti-fracking New Brunswick, Elsipogtog First Nation, fracking, Indigenous resistance, Mi’kmaq, Mi’kmaq Warrior Society, SWN Resources Canada. Bookmark the permalink. Leave a comment.